About the Platinum Rewards Portal. The Platinum Rewards Portal at DeseretBook.com/account/platinum is printed on most advertising communication pieces. The general public may access the landing page, view membership details and benefits, and choose whether or not to join. Only current or new Platinum Rewards members may access ensuing rewards and benefit pages by setting up an online account and linking to their Platinum Rewards account. Unless previously set up, members will set up an online account then provide their Platinum Rewards number (R# - printed on all catalogs, mailings, LDSLiving magazines, and store receipts) in order to tie their online account to their membership account. If you do not currently have a Platinum membership, you will be given the option to start or renew your membership. If you are a Platinum member, but your online account has not be linked to your Platinum account, you can register it by entering your rewards number in the indicated spot. If you experience any difficulties registering your account, please do not hesitate to contact our customer service team! 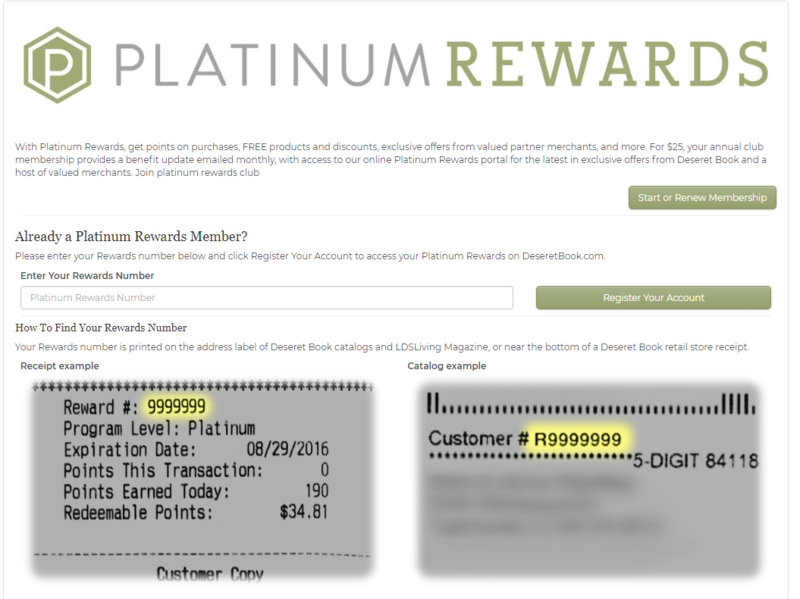 If you are currently a Platinum member, you will be able to review your Rewards Number and points balance. You will also have access to gain rewards and benefits from several different partner companies.